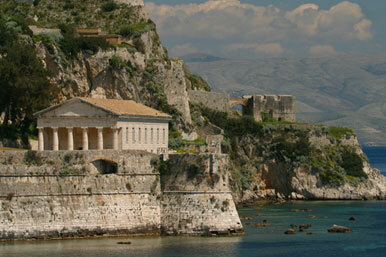 Corfu, the countess of the Ionian Sea, is the island that will enchant you on first sight. 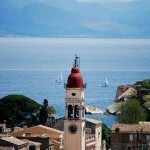 In the northern part of the Ionian Sea, between the Adriatic Sea and the coast of Epirus, Corfu has its own character. The enchanting landscapes, the unique architecture, music history, hospitality and great food are a few of the things you will enjoy during your stay. 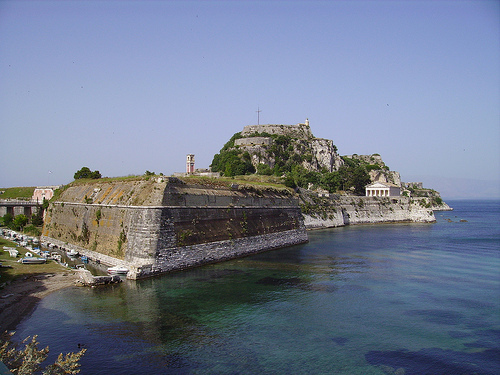 The name Corfu has emerged from the medieval era, probably because of the two peaks (in Greek “corifi”) on the hill, where the Old Fortress is built, which can be seen while the visitor approaches the island by boat. 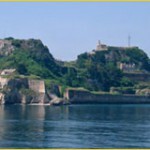 The wonderful adventure in Corfu starts entering the port. 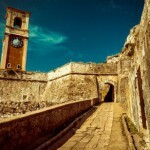 The Old City is what the traveler first sees, carrying him in times past. 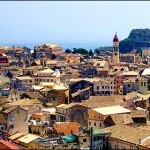 Corfu Town is one of the major sightseeing of the island, a cosmopolitan city with a rich history and culture. The strong European influences and the Venetian character are two of the reasons for its inclusion in the UNESCO World Cultural Heritage List. 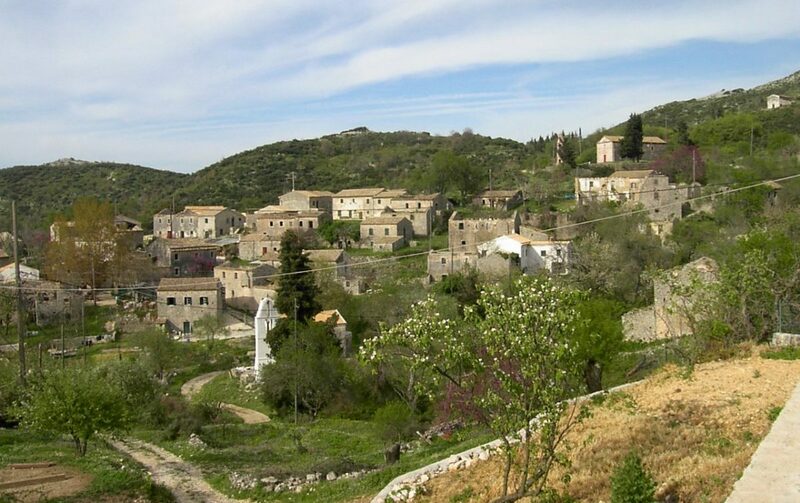 The journey continues enjoying lovely beaches, museums, breathtaking landscapes, picturesque villages, romantic sunsets and beautiful buildings, traditional foods, such as pastitsada, sofrito and bourdeto. 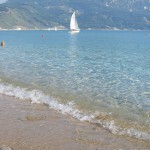 Most beaches are fully organized with available parking areas, tavernas, cafes and restaurants. 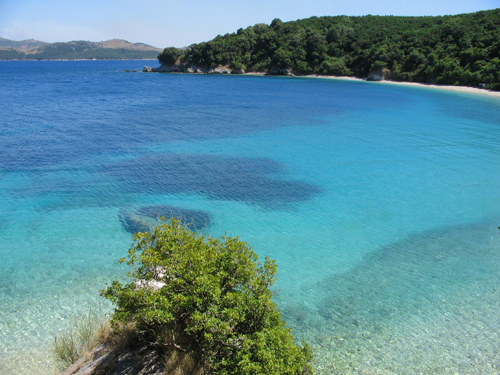 There are also many excursions to beaches and caves of the island of Paxos, the outlying Islands (Othoni, Erikoussa, Mathraki) and Albanian coasts. 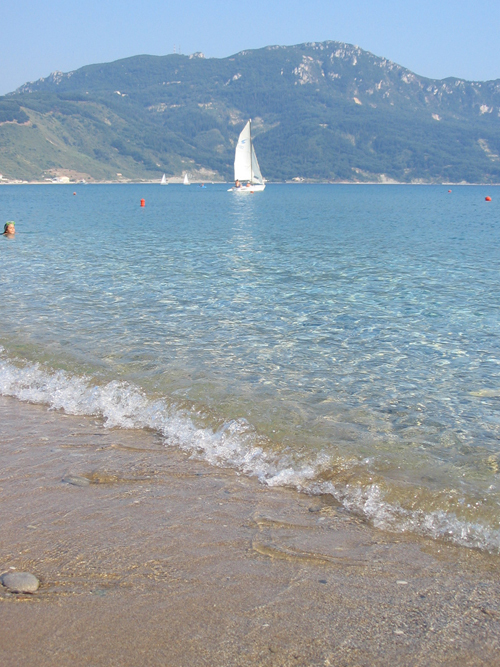 On many beaches are offered water activities and sports such as diving, surfing, kite surf, canoeing etc. 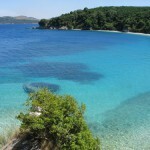 Finally, on the island there are Ideal Mountain bike, downhill, hiking and off road trails for adventurous jeep rides. 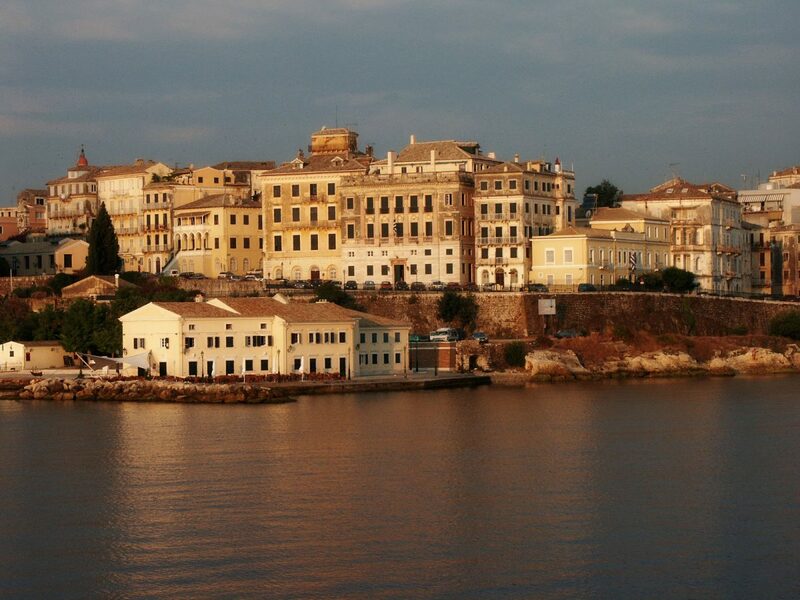 Completing the journey in Corfu do not forget to taste the traditional drinks and liqueurs (kumquat and ginger beer) and experience the cultural costumes as the barcarolles, traditional festivals and processions of bands. It exudes a sense of nobility, with main attractions the big square Spianada, which is the largest square in the Balkans, the Old and the New Fortress, the City Hall (Theatre San Giacomo), Liston, Mon Repo, the Museums of Byzantine and Post-Byzantine History and the old palace of the Archangel Michael and St. George, which now is used as the only Asian art museum in Greece. 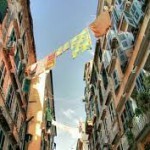 Guests are filled with wonderful images from the crowded alleys, called “kantounia”. 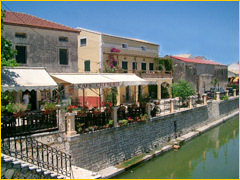 Walking in the Town you can find shops that follow the current fashion trends or ones with traditional products and souvenirs, old and modern cafés, luxury restaurants, quiet tavernas, where if you are lucky you may hear traditional songs, or you may end up in a shady hidden square and enjoy a ginger beer. Venetian mansions and buildings stand out everywhere painted with the traditional Corfiot colors of ocher, the burgundy and salmon. 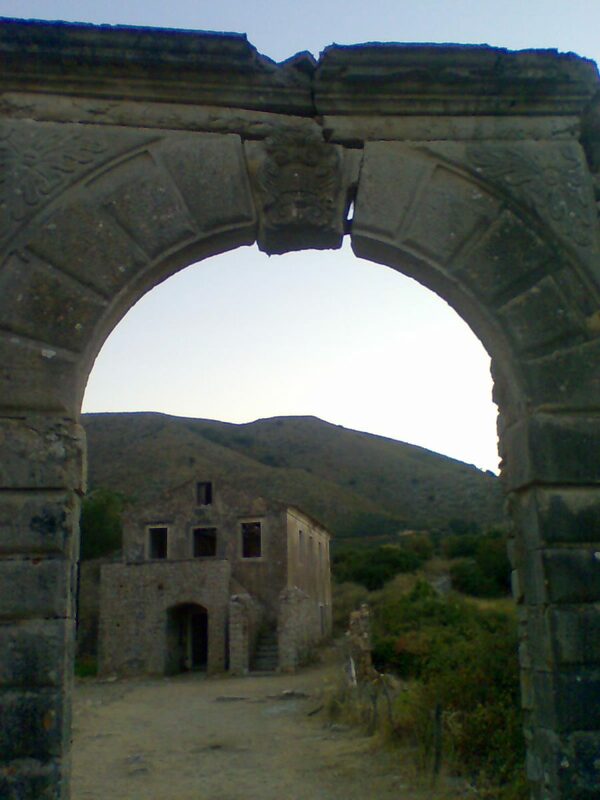 There are many churches such as the Catholic Cathedral of Saints James and Christopher, the Eastern Metropolis of Virgin Spiliotissa and the Church of St. Spyridon. 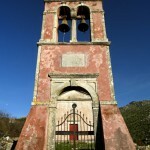 In this church there are the relics of the saint who is considered as the protector of the island. The relics of Saint Spyridon procession four times a year. The procession is always accompanied by four of the city’s philharmonic. 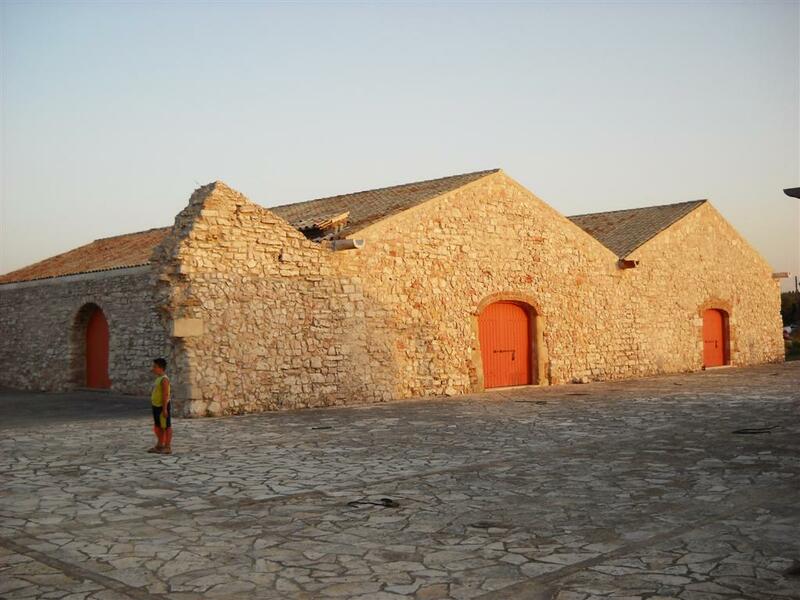 They are two of the most important defensive complexes constructed in the Mediterranean. 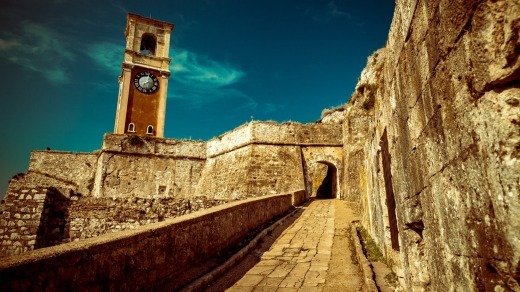 The Old Fortress of Corfu (Fortezza Vecchia) is built on a rocky peninsula with two distinctive hills and is considered as the eastern edge of the City. 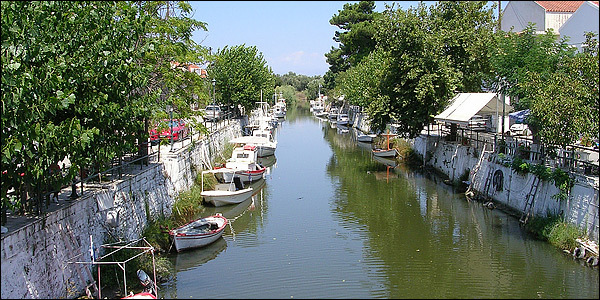 It is divided from Corfu town with an artificial moat, which was created for additional protection and is called Contrafossa. 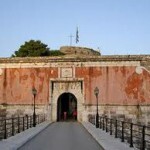 To enter the fortress you must pass the bridge that connects the city with the island. 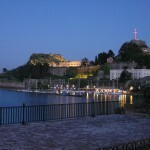 The Old Fortress now is used as a monumental open space, which hosts the Historical Archive of Corfu, the Public Library, the Byzantine Collection of Corfu, Services of the Ministry of Culture, the research lab for Greek music of the Ionian University and exhibition halls where musical or art events usually take place. 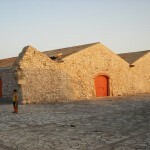 In the Old Fortress you may also find a cafeteria, a restaurant and souvenir shops. The New Fortress, (Fortezza Nuova), dominates the hill of San Marco, in the northwest of the city, and it is a true architectural masterpiece. 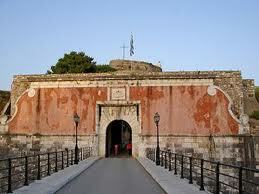 This monument was built during the Venetian period as a fortress. 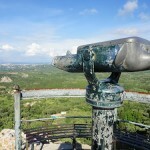 The visitor can admire the splendid constructions, visit one of the exhibitions (painting, photography, sculpture, etc.) hosted every summer in the halls of the barracks, and the winged lion of St. Mark, the symbol of Republic of Venice, you can see it entering from the north gate. 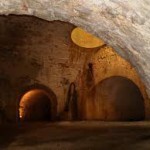 Enjoy also the Venetian and English barracks, ammunition depots and aqueducts, the church of Panagia Spileotissa of the 17th century and the modern Museum of Ceramic Art. 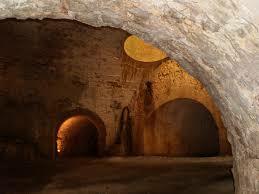 Don’t forget to follow the tunnel leading to the Bastions of Seven Winds. 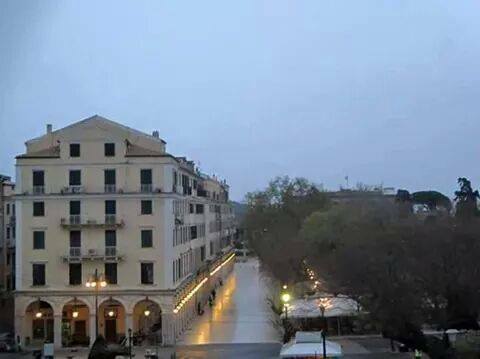 From there the panoramic view of the historic center of the city is breathtaking. 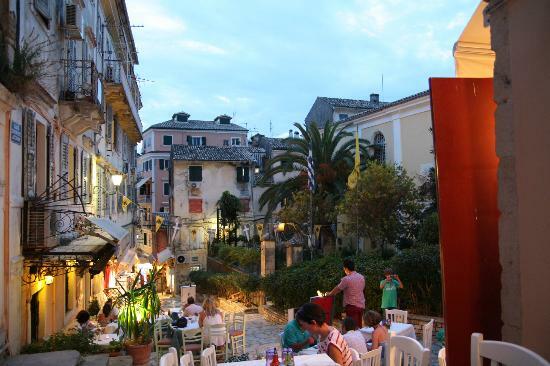 Surrounded by the Venetian Old Fortress, the English and the French palace style Liston, Spianada is the center of social life of Corfu! 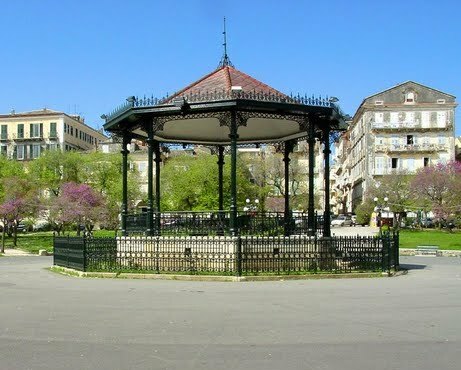 Spianada (Upper and Lower Square) is the largest square in Greece, whose name comes from the Italian verb «spianare» (raze). 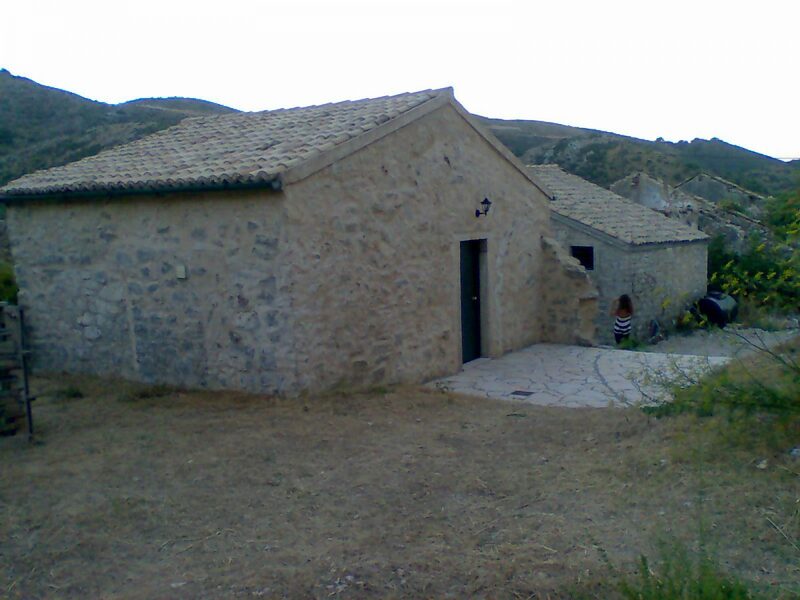 Undoubtedly, the jewel of Spianada is the Liston. This is the George A Avenue, with high-rise buildings created by the French and used as barracks. 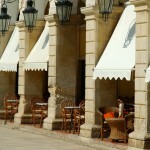 In the famous arched portico with lanterns, modeled on the Rue de Rivoli in Paris, there are now cafes and recreational areas. As for how it got its name, there are several versions. The most popular is that it comes from the Golden Book (Libro d’Oro), according to which the road could only be crossed by the Venetian nobility. 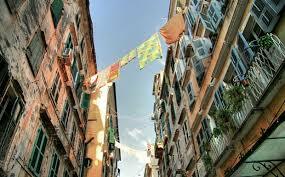 The truth, however, is that it comes from the Venetian Lista, meaning wide, straight road to walk. 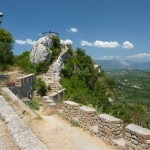 A nice route for walking is Garitsa. 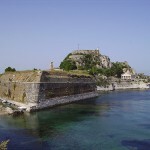 Starting from the picturesque windmills and reaching the Old Fortress, walking by the blue sea. 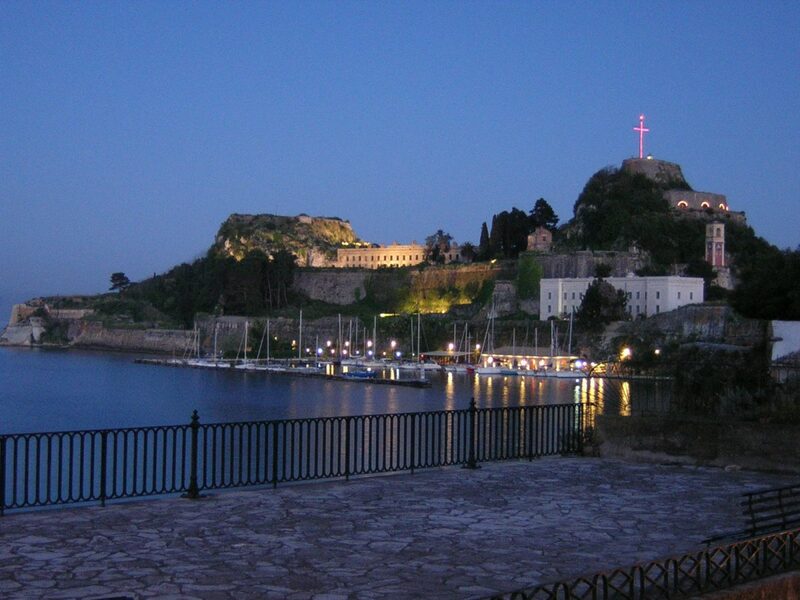 Pontikonissi is the most famous attraction of Corfu. You can see it on the way to Kanoni, close to the town. 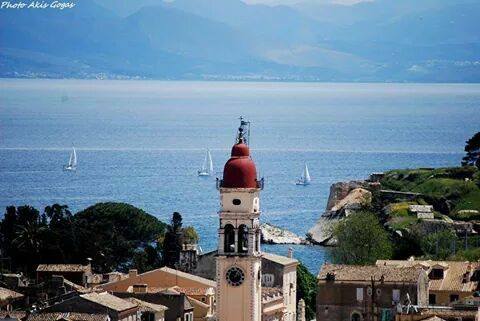 There are cafes with lovely view to Pontikonissi and the Church of Vlacherna and to the runway of Corfu. 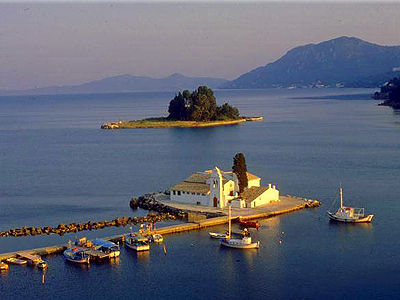 You can rent a boat to visit Potikonissi or walk on the narrow pier to visit the church of Vlacherna and watch the airplanes. 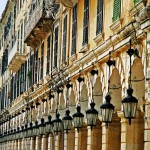 The Achillion is one of the most famous royal palaces of Europe and the most important architectural landmark of Corfu. 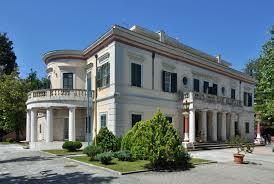 It is located in the village Gastouri and was built by Empress Elisabeth of Austria. 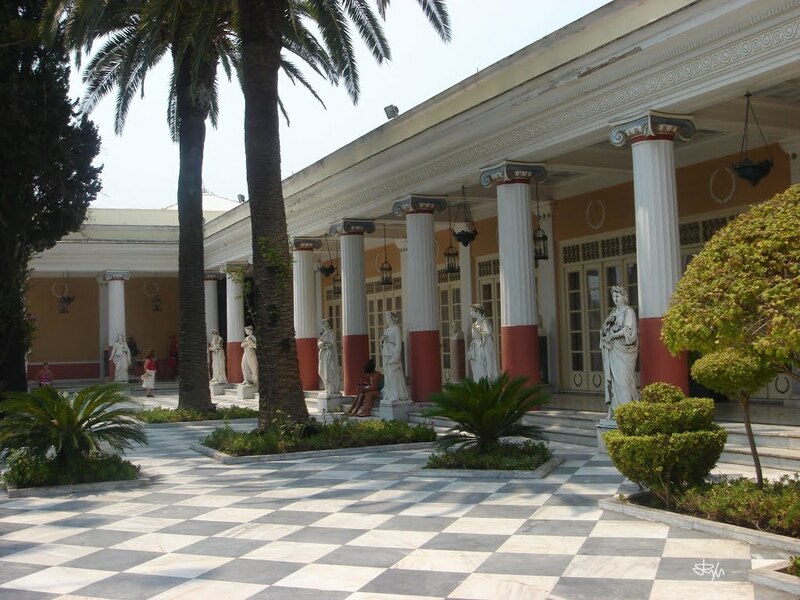 The palace was dedicated to Achilles and the courtyard was enriched with statues of ancient Greek mythology, the most famous are the “Seven Muses” and Achilles Dying of Cherter, a nice bronze statue. 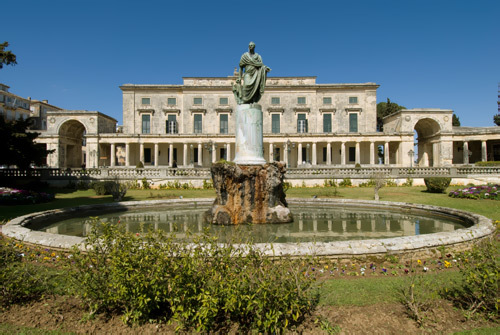 In 1904 the Emperor of Germany Wilhelm II (aka “Kaiser”) bought the Achillion, where he lived during his regular spring visits to Corfu. On the Inside there are frescoes and decorations of significant artists of the time of erection, while on the second floor there is an Ionic colonnade. 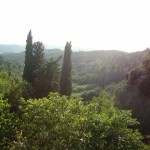 Around the palace are lush gardens with wonderful view. 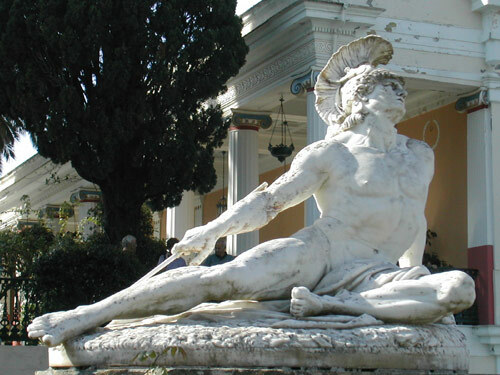 Gardens adorn many statues, especially of Achilles, the empress’s favorite hero, who gave the palace its name. 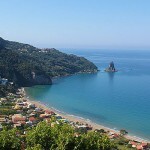 Kommeno is 10 km from Corfu Town, north of Gouvia Bay and is easily accessible. 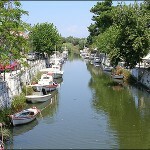 It is a place with villas and restaurants. 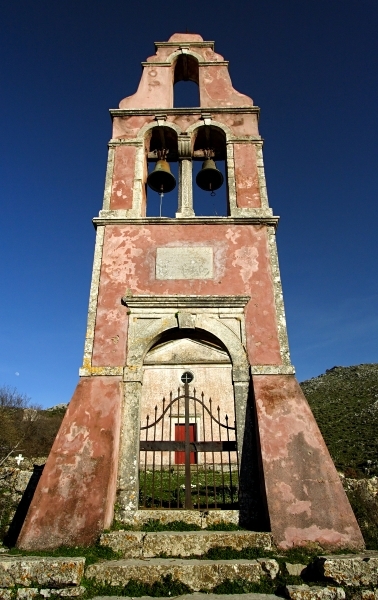 At the edge of Kommeno is a small headland where stands the picturesque “Ypapanti” church, which is very popular for weddings and baptisms. 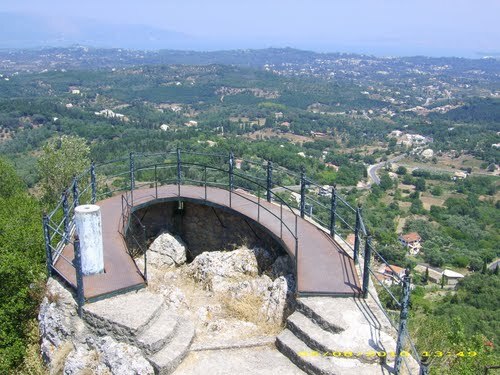 The «Bella Vista» which means beautiful view, is the point from where you can see the whole area of Paleokastritsa. 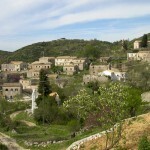 Enjoy the wonderful view from the village “Lacones”. 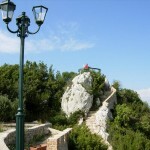 At the highest point of the village “Pelekas”, on an artificial platform on the rock, there is the “Kaiser Throoun”. 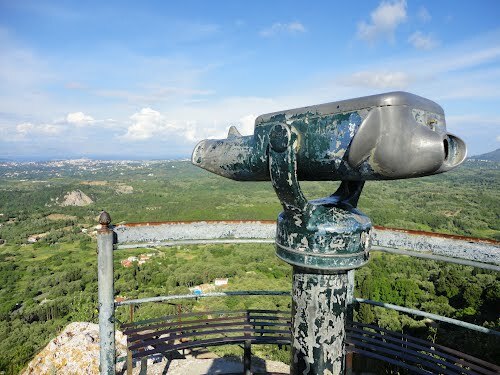 It is nothing more than an observatory where Wilhelm II loved to go for the magnificent view both towards the interior of the island, and to the sea. 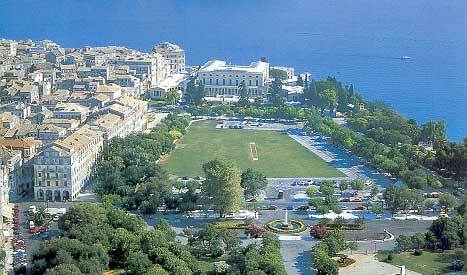 It was one of the favorite spots of the German emperor when he was spending his holiday in Corfu, at the palace of Achillion. There, you can enjoy one of the most famous sunsets of the west coast of Greece. 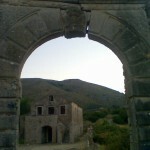 At this point you can arrive passing through the village of Pelekas. Don’t forget to try traditional recipes in the taverns of the village after a swim at the beach “Kontogialos” which is the nearest beach. 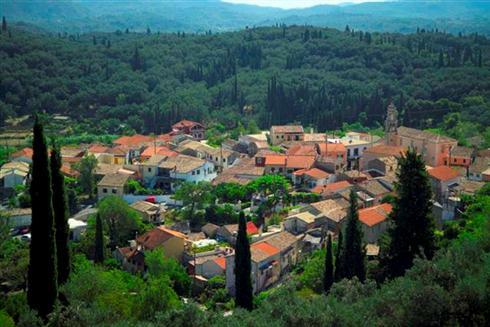 Ano Perithia or otherwise Old Perithia is a picturesque village in northern Corfu. 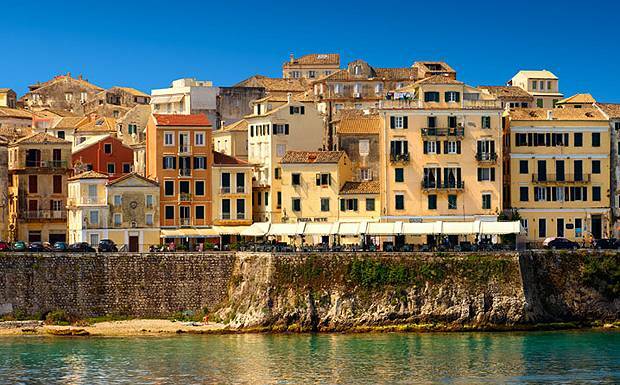 It is the oldest village of Corfu and its position was commanded by the fear of pirate raids and malaria that tortured the coast. 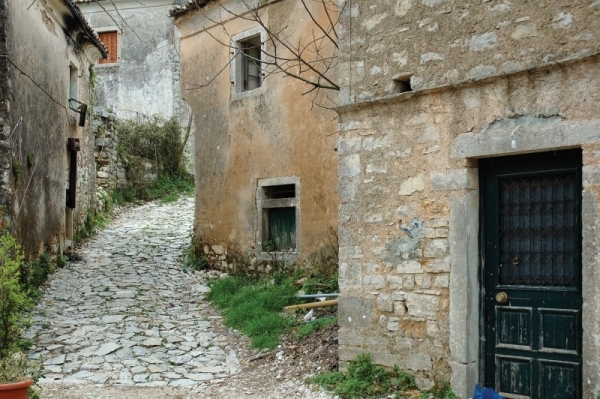 The Old Perithia is a ghost village and a wonderful example of the traditional architecture of the island. 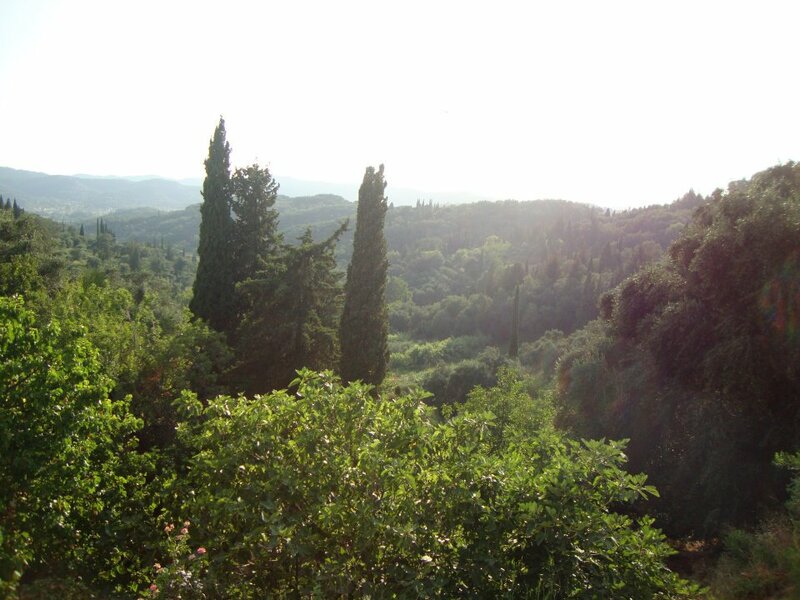 It has been characterized since 1980 “as a landscape of natural beauty and architectural ensemble in need of State Protection, because there is a remarkable settlement with 130 houses of Venetian architecture and several churches surrounded by an exceptional landscape beauty “. 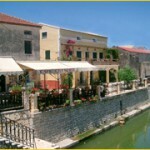 Today you can visit the village and have lunch in one of the taverns. 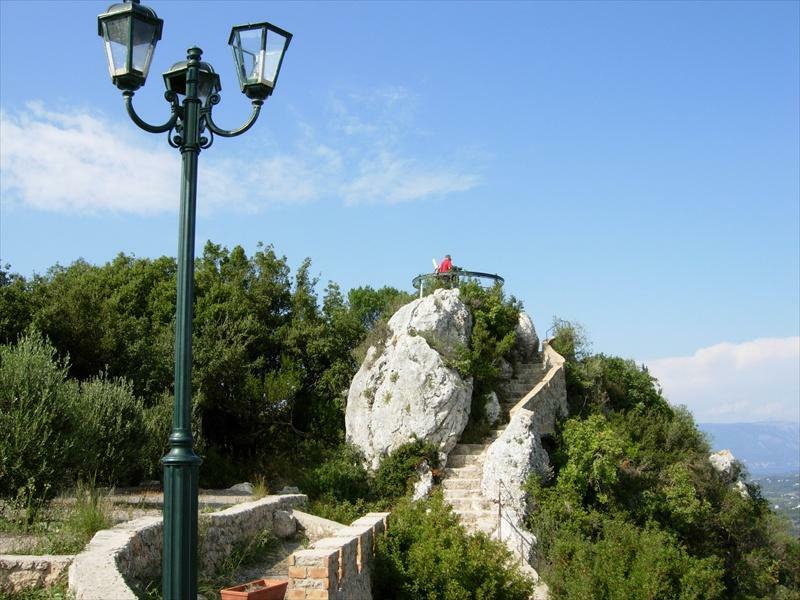 The mountain Pantocrator in the northeastern part of the island with 911 meters height is the highest point of the island. 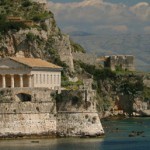 There you will find the temple of Pantokratoras and admire the view of the entire island. 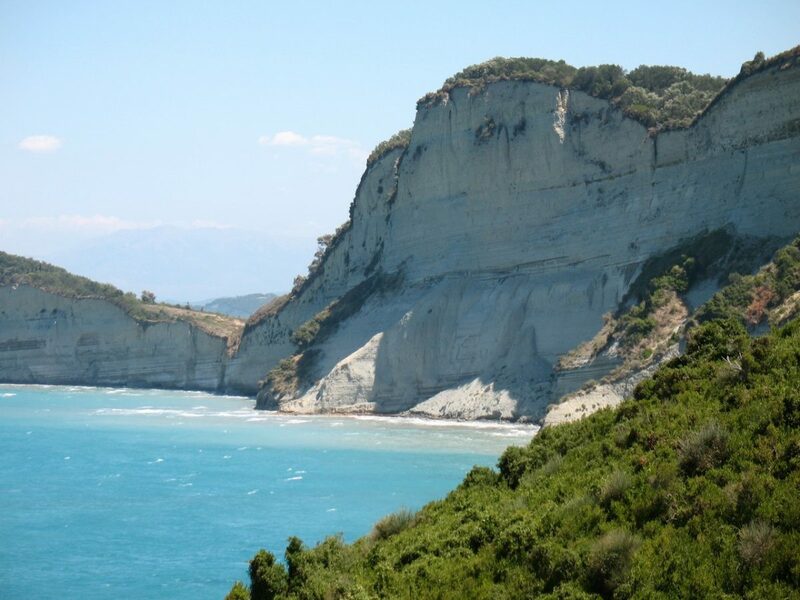 When the weather allows it, you can see Paxos at the south of Corfu or the small Islands Othoni- Erikoussa- Mathraki at the north. The route to the top is difficult and there are also ideal trails for Mountain bike, hiking and a beautiful off road route if you want to go on a ride with your Jeep. Lake Korission is a place with rich biotope. Many birds on their way to warmer countries stop on the calm waters of the lake. If you are lucky you may watch a flock of migrating birds. The Korrision Lake is protected as area Natura. 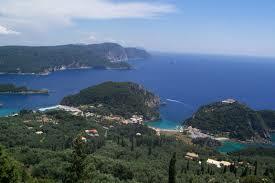 Lefkimmi is an area south of Corfu starting from Vitalades and extends up to Cavos and is crossed by a river. 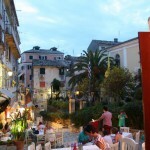 In Lefkimmi there are restaurants and taverns and you can also admire the squares and the churches. “Alikes” used to produce salt in the past. 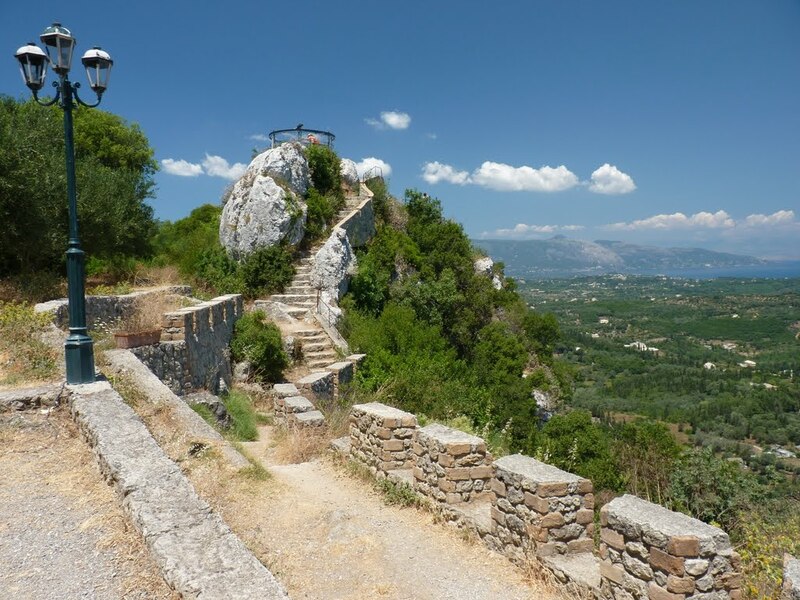 Dukades is a lovely, picturesque village of Corfu and is located in the north, 20 km northwest of Corfu Town and only a few kilometers from Paleokastritsa. 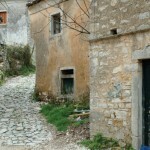 Dukades are characterized as a traditional settlement. 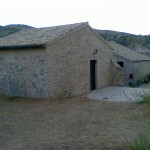 There you can admire the restored stone mansion, the Venetian type “Sagrada” of Kouartanou and the building of the elementary school located at the entrance of the village. 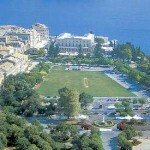 In the lovely village square you can enjoy traditional recipes of the island after visiting Paleokastritsa. Next to the Old Town is the green estate of Mon Repos, with an area of ​​258 acres of dense vegetation and beautiful gardens. 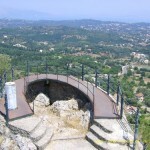 It is just 3 km from Corfu town and occupies most of the hill of Ascension. 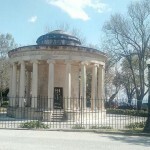 The British High Commissioner of the Ionian Islands Frederic Adam built it as his summer mansion in 1831for the sake of his local beloved wife Nina Palatianou. 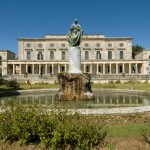 After the Union of the Ionian Islands with Greece, the city of Corfu gave the palace and gardens in the dynasty of George I in order to use it as a summer residence. King George named it Mon Repo (My Rest). 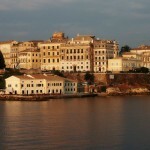 The palace has exceptional view at the sea and Garitsa. 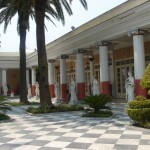 Today at Mon Repo it’s the Museum of Paleopolis. 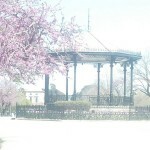 It ralso hosts an open-air theater, where many known performances take place during the summer months. 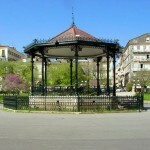 The foundation of the Philharmonic tradition of Corfu began during the first period of English Protection, in response to the refusal of the British to provide musical accompaniment for Orthodox processions (1837) and since then it specifies the musical life and development of Corfu. 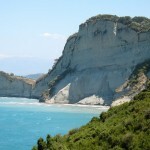 The Ionian Islands and especially Corfu have been influenced by Western musical trends. 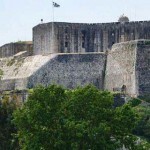 On the island there are 18 Bands of which four are located and operating within the limits of the Municipality of Corfu. 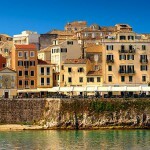 They play a leading role in the festivities and cultural events of Corfu and beyond the limits of the island. 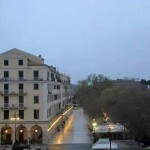 If you are lucky you may see one of them play at the Kantounia or at the Spianada square. 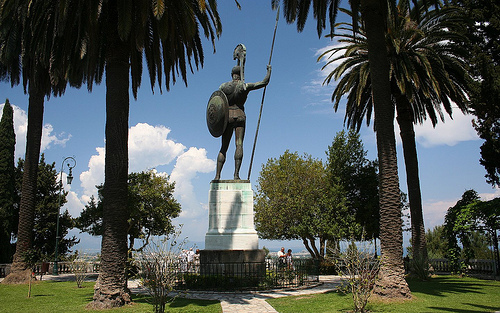 One of the most famous musicians of Corfu “Nikolaos Mantzaros, wrote the music on the Greek National Anthem. It is accommodated in a building, where in the 17th century “The Club of the noble of the city” used to be and it took its name because it is located next to the Catholic Cathedral of Saints Jakob and Christopher. 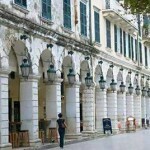 The building is painted with issues of the life and mythology of the island. 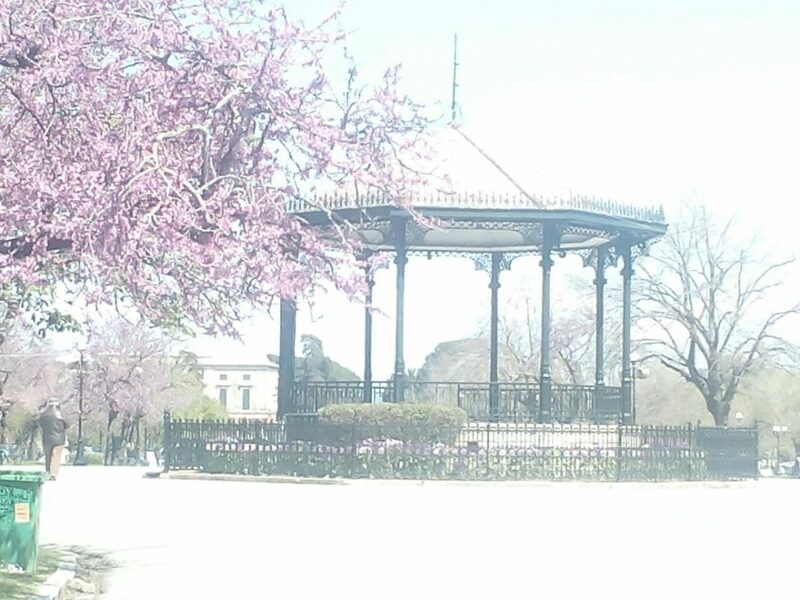 A century later, worked as a theater and hosted a variety of musical and theatrical performances. 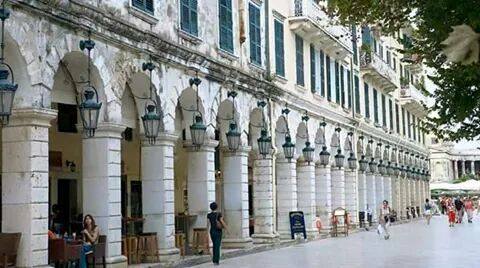 The Ionian Academy was the first Greek University of modern times, which was founded in Corfu in 1824. 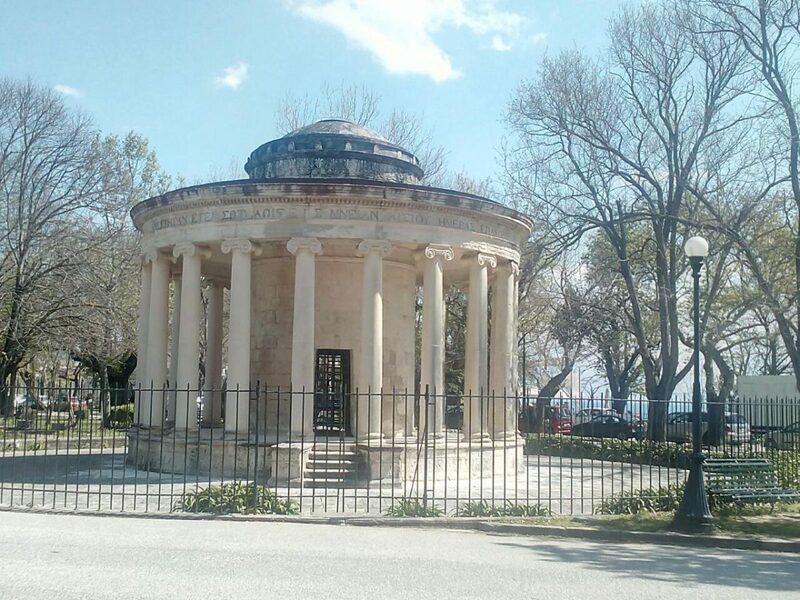 With the union of the Ionian Islands with Greece, the Ionian Academy closed and the Ionian University was founded several years later, in 1984. It consists of three schools: The School of History & Translation – Interpretation, the School of Computer Science and Informatics and the School of Music & Arts. The Count Ioannis Kapodistrias was a Greek diplomat and politician. 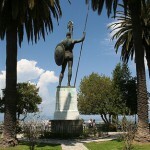 He was the first governor of Greece. 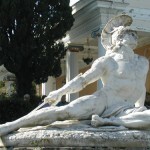 He came from an old family of Corfu and was murdered in Nafplion on October 9, 1831 by political opponents. 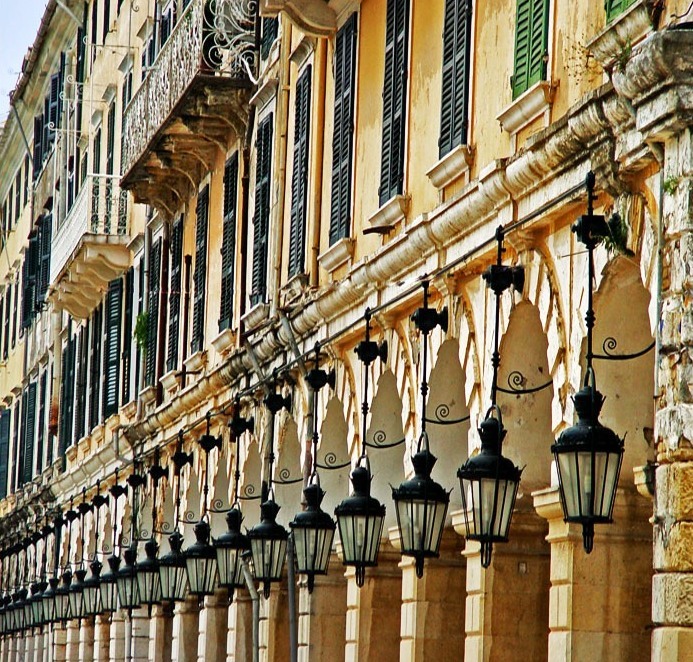 One of the most important buildings of the Old City is the Kapodistrias Mansion. 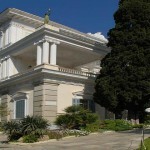 Built in 1832 on the old mansion Kapodistrias, where Ioannis Kapodistrias was born, today is part of the Ionian University.